Binay Tamang has emerged as a new Gorkha leader from the ongoing conflict, and clearly he is now the force to reckon with, according to a key Darjeeling district official. Kolkata: Only about four years ago, BinayTamang’s car was stopped on the outskirts of Darjeeling town by Gorkha Janmukti Morcha (GJM) activists enforcing a shutdown strike. He was by then already a prominent GJM leader in the hill town, but was little known outside it. Even when Tamang, now in his fifties, told them who he was, the activists wouldn’t let him go. “His name was known, but no one outside Darjeeling town knew what he looked like,” recalls a close aide, who asked not to be named. Shadowed by Bimal Gurung, the GJM president, Tamang was hardly ever seen as taking the driver’s seat until he suddenly came to the forefront last month, unilaterally announcing the suspension of the indefinite strike in Darjeeling. For defying the hardliner Gurung, he and his aide Anit Thapa were immediately ousted from the GJM, but in the past month, they have only tightened their control over Darjeeling. A new Gorkha leader has emerged from the ongoing conflict, and clearly he is now the force to reckon with, according to a key Darjeeling district official, who, too, asked not to be identified. Not surprisingly, Gurung’s followers allege Tamang has managed to grab power because of the backing of the local administration. “The police will turn against us if we spoke out against Tamang,” said Topden Bhutia, a central committee member of GJM. Only a few months ago, Tamang tore up and set fire to the agreement to form the Gorkhaland Territorial Administration (GTA), pulling down the five-year-old administrative body that ran Darjeeling and Kalimpong districts. With the state’s blessings, Tamang and Thapa are at the helm of GTA again, now trying to restore governance in the hills. With the indefinite strike approaching 100 days, Tamang and Thapa were quick to realize that people’s patience was wearing thin, said the official cited above. And they took advantage of the fact that Gurung is on the run and people had started to give up on his ways of taking the movement forward, he added. Even at the start of the agitation in early June, Tamang was “very close” to Gurung, according to the official. He claims to be a founding member of GJM, whose responsibility early on was to make inroads into Darjeeling town—a stronghold of the late Subhash Ghisingh of the Gorkha National Liberation Front (GNLF). Gurung rose with the support of tea garden workers and transport operators, and relied on Tamang to gain control of Darjeeling town from the GNLF. Slowly, his popularity spread to Kalimpong, Kurseong and Mirik towns as well. Amid shifting sands, Tamang now claims he will carry on the movement to carve out a separate state for the Gorkhas, but only by peaceful means. “Clarity will emerge only when the dust settles,” said the hotel owner. 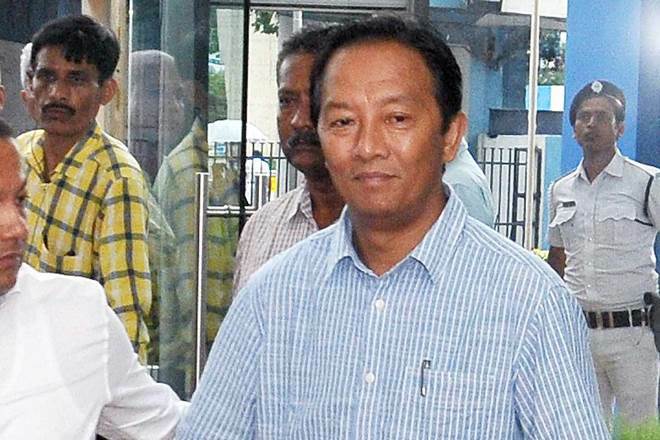 Kolkata: Expelled Gorkha Janmukti Morch (GJM) leader Binay Tamang on Sunday requested for Centre`s intervention in Darjeeling hills during his meeting with West Bengal Governor Kesari Nath Tripathi at Raj Bhawan, Kolkata. "The issues related to the series of bomb blast and the recently recovered arms and ammunitions in the Darjeeling Valley have been appraised in meeting. We have requested the Governor to appraise the Centre about the same", said Tamang in a press conference after the meeting. The former GJM leader said, "We want to talk to the Centre regarding the matter and want their intervention in the area as it is sensitive area." "We want the central government to talk about all pending issues as well as the Gorkhaland issue," added Tamang. In the last few months, Darjeeling has been witnessing indefinite shutdown over separate Gorkhaland by various hill parties which have been spearheading the agitation, including the GJM activists. BinayTamang has emerged as a new Gorkha leader from the ongoing conflict, and clearly he is now the force to reckon with, according to a key Darjeeling district official.